Sarchi is the Costa Rican folk crafts center and home of the carrieta festival. If you need wood or leather work Sarchi is the place to go. 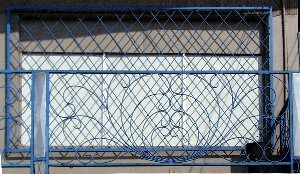 This grill is typical of the many "rustico" pieces made with rebar and attempting to be fancy ironwork. Although Sarchi has wonderful wood and leather there is no metalwork and the examples used are no better than elsewhere in Costa Rica. This balcony railing is on a commercial building in Cuidad Quesada (also known as San Carlos). 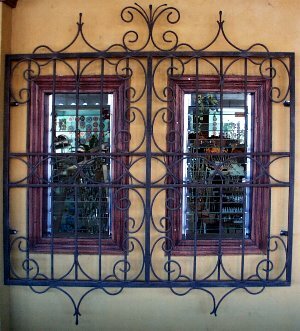 Like most ironwork in Costa Rica it is painted a color that complements the building and is the same as the trim. Low quality high class The gate to the left is part of a typical Costa Rican entrance similar to below. The arch is pieced together. The scroll elements have unsightly flat ends. I'm sure the customer wanted better. 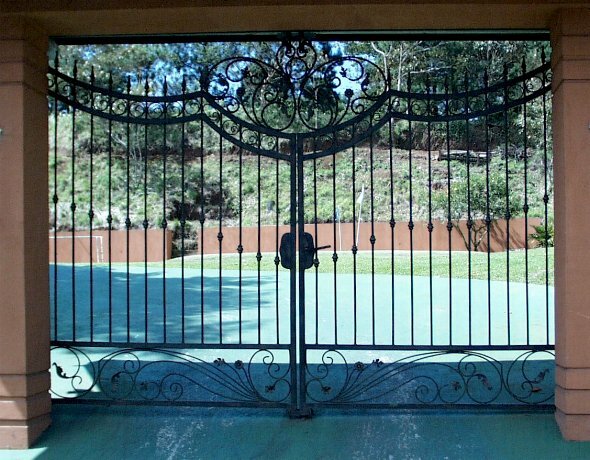 Fabricated gate with purchased components: This is as good as you will see anywhwere in the world of this class. 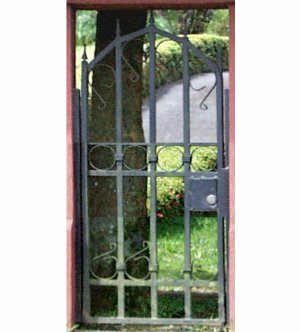 It is fairly rare in Costa Rica where every other home or business has an entrance of this type. 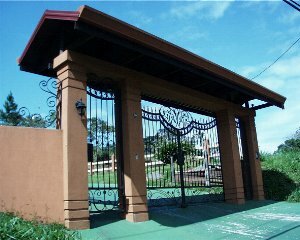 This gate and entrance are on property adjoing to the detail above left. I have heard this called the "component desease" by one European smith. The use of cheap components is spreading everywhere and just becoming common in Costa Rica.